The Sword and The Sorcerer (1982) | 'TAIN'T THE MEAT… IT'S THE HUMANITY! It’s 1980’s fantasy movie season here at Taint The Meat, and this time it’s the turn of this classic from 1982: The Sword and The Sorcerer. The Sword and the Sorcerer, one sheet poster. 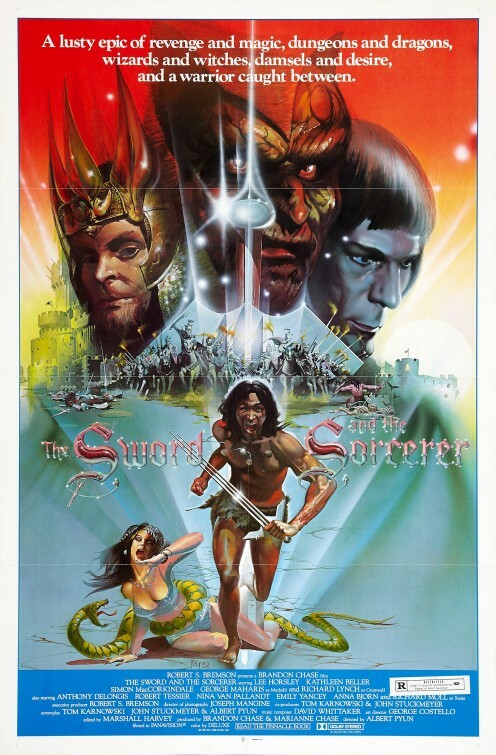 Blessed with one of the most evocative fantasy film titles ever, The Sword and The Sorcerer stars Lee Horsley, Richard Lynch, Kathleen Beller and Simon MacCorkindale. Set in a medieval fantasy world the plot centres around Talon (Horsley), the rightful heir to the land of Ehdan, who after witnessing the brutal slaughter of his family by the evil King Cromwell (Lynch) flees for his life, his only possession his father’s three-bladed projectile sword (the tri-sword, possibly the coolest and most impractical sword ever made). Years pass and the adult Talon, now a famed warrior and adventurer, returns to his homeland and is drawn into a plot to defeat Cromwell and avenge his family’s murder. Throw in an evil wizard (ably played by Richard Moll), some decent fights, as well as a liberal amount of T&A and you have all the makings of a pretty decent ’80s fantasy flick. 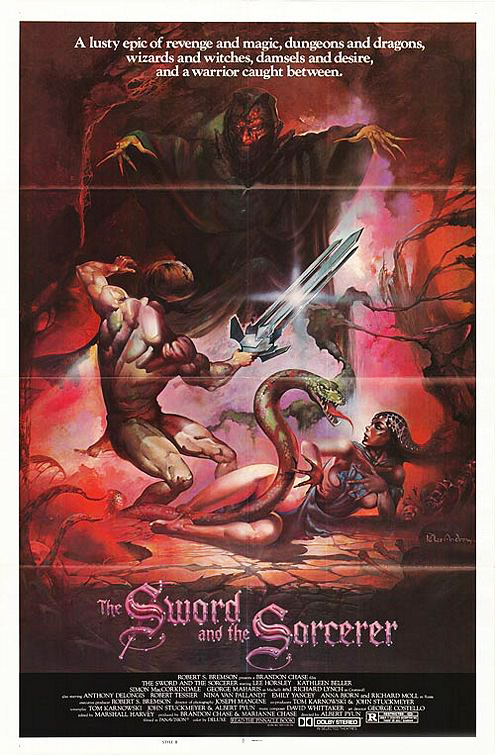 The Sword and The Sorcerer was directed and co-written by Albert Pyun (who helmed more than his fair share of shlock in the ’80s and ’90s) and he does a pretty decent job keeping the action flowing. The film’s plot is surprisingly convoluted (especially in the first act) but all the plot points are wrapped up just after the one-hour mark and the rest of the film is one long satisfying fight. Cromwell is defeated, the evil sorcerer slain, and Talon gets the girl before (literally) riding off into the sunset. At times The Sword and The Sorcerer feels more like an old school adventure film that a fantasy flick, one that’s more reminiscent of Errol Flynn’s The Adventures of Robin Hood than your usual fantasy offering, and David Whitaker’s evocative music score reinforces the film’s high-adventure influence. And it’s no worse for that. The Sword and the Sorcerer is just good fun; it’s action packed, funny when it needs to be and the whole thing just rattles along at a brisk pace. That’s not to say there isn’t a fair amount of blood and gore in the film: the death of slave girl Elizabeth (Anna Bjorn) is quite brutal, as is that of her killer. And Talon’s fight with Cromwell, and then Xusia the sorcerer, is also pretty graphic. The film was a hit when it was released, raking in almost $40m against its modest budget, making The Sword and The Sorcerer the most successful independent film of 1982. The critics hated it of course, but then again they rarely had anything positive to say about sword and sorcery flicks from that time period. At the end of the movie, in a move reminiscent of the James Bond films, it was announced that Talon would soon return in Tales of an Ancient Empire. However, fans would end up waiting almost 30 years for that follow up, which sadly is utter dreck. Even as a fan of The Sword and The Sorcerer I couldn’t get more than halfway through the sequel, which easily ranks as one of the cheapest and most amateurish film’s ever made. As much as I enjoy The Sword and The Sorcerer (a guilty pleasure if ever there was one) a great deal of my affection for the film is rooted in its VHS origins. In the early to mid Eighties VHS Home Video was coming into its own, and I have fond memories of visiting my local video rental shop (a converted tire showroom) on a Saturday night with my folks to pick out a film that we could watch at home. In an age of YouTube and on-demand film and TV anyone under the age of 30 might have trouble appreciating what a special treat it was to watch a film in the comfort of your own home. Those visits to the video shop had an almost magical quality to them, and I can still clearly recall entering the shop and being thrilled by the huge selection of films, all resting in those massively oversized black plastic cases. I also recall that The Sword and The Sorcerer was one of those film’s that was always booked out. When I did finally get a chance to see it the VHS quality was such that the film’s finale (set in a dark cave) was so poor I couldn’t actually see what was going on. It wasn’t until I saw the film on DVD in the early 2000’s that I could fully appreciate its ending. I won’t go as far and say that I actually miss VHS (give me Blu-ray any time) but I surely do miss that video shop. Coming soon: another classic fantasy film from the 1980’s, Hawk the Slayer.